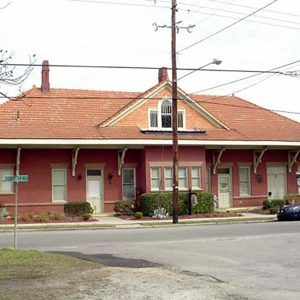 The South Carolina Western Railway Station (now known as the Seaboard Air Line Railroad Station) is significant for its association with several railway companies that played major roles in Darlington’s economy in the first half of the 20th century. The South Carolina Western Railway was chartered in Darlington in 1910. Its rail line to McBee opened to service in early 1911, and this station was completed shortly thereafter. It was designed and built by Lawrence Reese, a self-taught black master carpenter responsible for many houses in Darlington (including 14 in the West Broad Street Historic District).